Want to learn Fundamental of Instance Method? In Java, an instance method in a subclass with the same signature and return type as an instance method in the superclass overrides the superclass’s method. The ability of a subclass to override a method allows a class to inherit from a superclass whose behavior is close enough and then to modify behavior as needed. The overriding method has the same name, number and type of parameters, and return type as the method it overrides. Basically it’s the definition of method hiding in Java. An overriding method can also return a subtype of the type returned by the overridden method. This is called a covariant return type. When overriding a method, you might want to use the @Override annotation that instructs the compiler that you intend to override a method in the superclass. If, for some reason, the compiler detects that the method does not exist in one of the superclasses, it will generate an error. If a subclass defines a class method with the same signature as a class method in the superclass, the method in the subclass hides the one in the superclass. The distinction between hiding and overriding has important implications. The version of the overridden method that gets invoked is the one in the subclass. The version of the hidden method that gets invoked depends on whether it is invoked from the superclass or the subclass. 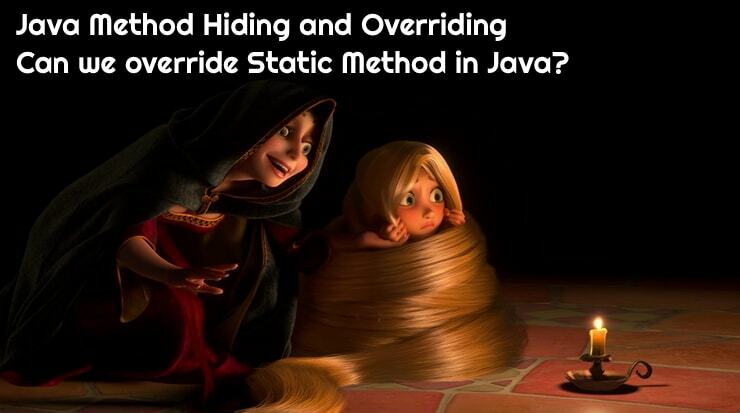 No, you cannot override static method in Java because method overriding is based upon dynamic binding at runtime. Usually static methods are bonded using static binding at compile time before even program runs. Basically, keyword static modifies the lifecycle of variable and method. If you specify static method or variable then those are created at the time of class is loaded and not at runtime. Nonstatic variables and methods are only available during runtime. Kindly take a look at inline comment descriptions for some more information. Java Collections – hashCode() and equals() – How to Override equals() and hashcode() Method in Java?